Finding the best food for a Labrador can be a monumental task just like the Siberian Huskies. Those guys like to eat! I mean really, they go through so much food it can seem impossible to keep up with their bottomless-pit stomachs. Because feeding a lab involves buying insane amounts of grub, it can also be tough to find a good food for dogs that has all the ingredients your lab needs without spending hundreds of dollars a month on food. Hopefully we can help. We talked to several registered breeders and trainers to figure out the most important nutritional requirements for labs. We tested several different foods (not ourselves, of course; we have our very own in-house dog food tester named Chewie). In the end, we landed on what we think are five of the best dog foods for Labradors. So check it out! **Below, you'll find our expert's science-backed reviews, but you can also click the links above to see current prices or read customer reviews on Chewy. 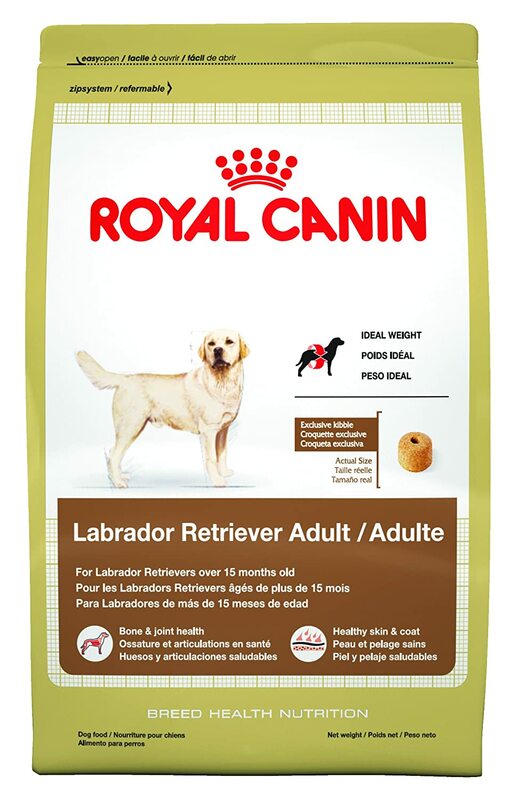 What Does My Lab Need from a Good Dog Food? You have to be careful with labs. They love to eat, and they usually don’t particularly care what kind of food you put in front of them. So even if you feed them crappy, low-quality food with a bunch of commercial filler products, they’ll scarf it down like it’s a T-bone steak. In other words, your lab isn’t going to tell you what’s good and what’s not. To him, it’s all good! It’s up to you to monitor his caloric intake and overall nutrition. So how much does he need? Labs are big dogs, and a lot of the time they’re fairly lazy. There’s also some debate among dog nutritionists about how many calories your dog needs. In general, though, your lab should be consuming about 30 calories per pound of bodyweight. If he’s less active, reduce that number to 20 or 25 calories per pound of bodyweight, and then monitor his weight. 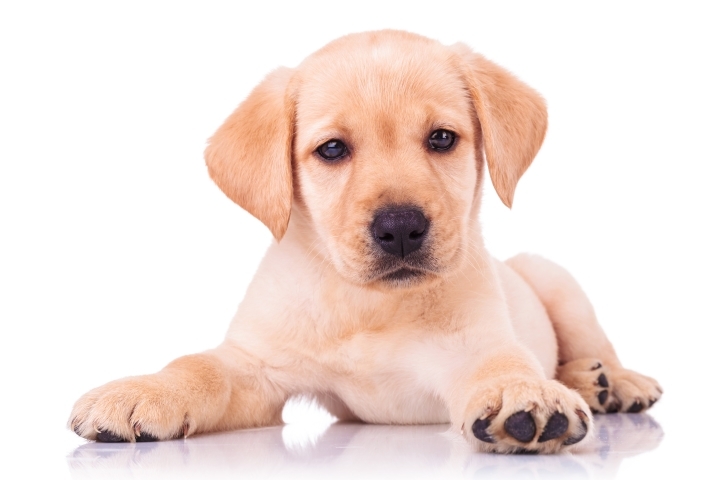 Labrador puppies usually need twice that amount, so around 50 calories per day per pound of bodyweight, which you can gradually reduce to 30 calories per pound per day as he gets older. For labs, that usually means that he should be healthy and maintaining his bodyweight at 30 calories per pound when he’s two years old. And, of course, senior dogs need slightly fewer calories: usually about 20 calories per pound of bodyweight. There are a few things to keep in mind, though, and they could really affect how many calories your dog needs. · Labs are typically very active. They may need even more calories than you think, which means you have to keep an eye on their weight. You may even want to invest in a simple, at-home pet scale. · Labs stay active longer. Lots of dogs experience a rather drastic energy decline in their old age. Labs are usually a bit different, staying pretty active even in their senior years, which means they may need more calories, kind of like, say a pit bull would. The main takeaway is that you need to keep an eye on your lab’s weight and find an appropriate caloric intake level for your specific little buddy. The good news, however, is that it’ll be a lot easier to understand how much protein, fat and carbs you need, and you won’t have to keep such a close eye on it. Since labs are such active dogs, they need a bit more protein than average. At the very least, look for a dog food with at least 25% protein. With some breeds, 25% protein is a good number to shoot for, but with labs, it’s the minimum requirement. If you can find a food with up to 50% protein, that’s ideal (although that’s a bit rare). The other main number you want to keep in mind is fat. Labs have thick coats, and they shed a lot, which means they’re always losing hair. So you want at least 5% of your lab’s food to come from fat, which will help keep that nice sheen labs are known for. This video provides a pretty simple, yet informative pet profile of the breed. If you’re thinking about adopting a labrador or already have one and need to learn more about them, then you should definitely check it out. Labrador retrievers are prone to a few common health issues. Here are a few problems to watch out for and a few ingredients you can include in your dog’s diet to help prevent—or even treat—some of these annoying doggy woes. Obesity. Like we said, labs love to eat, and it doesn’t particularly matter what you put in front of them. They’re super, super food-motivated, which makes them very easy to train, but it also makes it easy for them to put on a few unsightly pounds. To counteract this, try to find foods in which a good, lean protein is the main ingredient. As a general rule, the higher the protein content, the more nutrient-dense (more nutrients per calorie) a food will be. These foods will be just as tasty and just as filling, but they’ll have fewer calories, which can make it easier for your companion to maintain a healthy weight. You can also opt for a diet food for your dog. It’s tough to recommend a lot of these types of foods, since they’re often more heavily processed, but if they’ve got good ingredients, they can be a good buy. Arthritis and hip dysplasia. Most labs I’ve known have developed hip problems at some point. It just comes with the territory of being a big, active, playful dog (although it affects medium dogs, like boxers, as well). There are a few ways you can combat this with your dog’s diet. First, make sure his food includes at least 800mg of calcium through whatever ingredient you can. If you can’t find a food that includes that, ask your vet for a good calcium supplement. You can also avoid grains altogether, which some vets recommend for older dogs with bone and joint problems (although I don’t know and couldn’t find the science behind it). 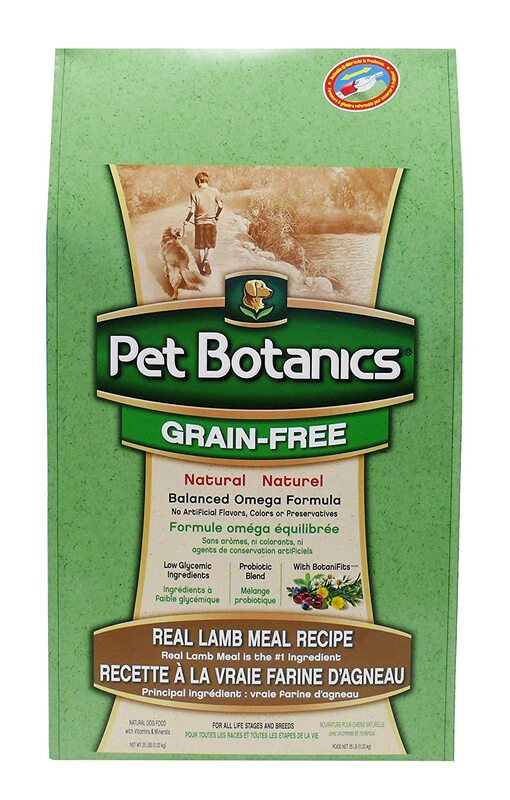 This Pet Botanics formula is supposed to be for “all breeds and life stages,” but it happens to be just about perfect for an adult Labrador retriever. One of the things I like most about this particular dog food is that it’s grain-free, which can help with those all-too-common hip problems. It’s also got a nice, healthy portion of protein that comes directly from the muscle of the chicken. This recipe does not include any corn, soy, sugar or other simple carbohydrates you might find in some of the bigger brands (in general, we stay away from a lot of the bigger brands). You’ll also find a healthy serving of animal fat, which is supplemented with sunflower oil. Typically, I like to see flaxseed or fish oil in my dog’s food. Chicken also contains omegas, but not as many. Overall, though, this labrador food checks all the boxes rather nicely. Plus, our dog, my boss and our in-house taste tester, thought it tasted really good! This is antoher great food, but it’s one you’ll have to be careful with. I like it because it’s made with high-quality, fatty beef and beef liver. Best of all, it contains bacon. And who doesn’t love bacon? I also like that there’s plenty of calcium in this formula, and calcium is one of the things we’re looking for in a good dog food for labs. However, it also includes grains, so it’s best for younger laps, underweight dogs, or dogs who don’t have any joint problems. It also contains molasses and sugar. That’s great for flavor, but those are simple carbs, and they can lead to weight gain if you’re not careful. So just keep an eye out. The main benefit here is taste. Our pup absolutely destroyed her sample of this, which is always a good sign. I’d probably recommend using for underweight, picky dogs (if you can even find a picky lab) or to supplement a leaner dry food. I really like almost everything about this dog food. The only reason it’s not ranked higher is that it contains more corn than I typically like to see in a lab food. It’s not the main ingredient (chicken meal is), but it’s still more corn than I like. That said, everything else about the recipe is pretty stellar, and it’s well-formulated for labs transitioning from the puppy phase into the adult phase. There are grains here, but there’s also very little sugar, which can help curb the “freshman 15” labs like to put on around the 2-year mark. 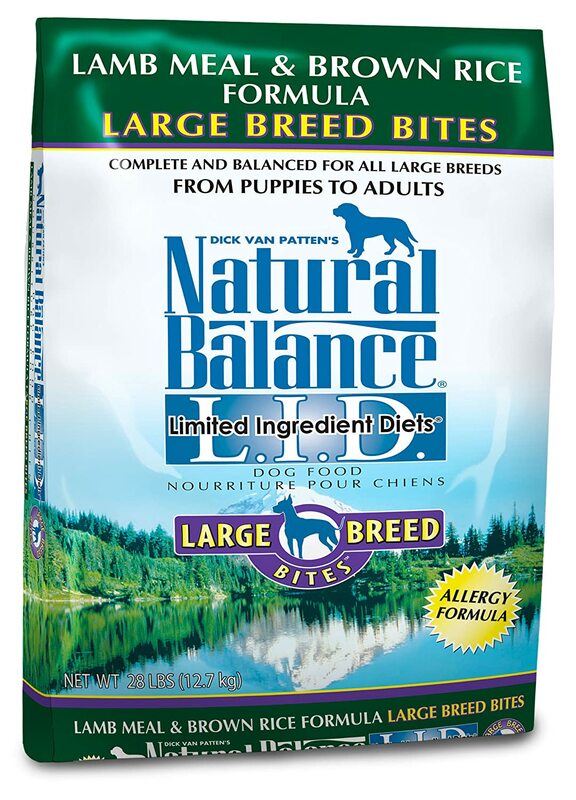 Natural Balance’s limited ingredients formulas have become a go-to recommendation for me. They have much, much fewer ingredients than virtually every other commercial dog food on the market, making it really easy to (1) read the nutrition label and (2) understand exactly what you’re feeding your little puppy compadre. I also like this particular recipe because the main ingredient is lamb, which is a high-fat meat and can help your lab maintain a healthy coat. Most of the other calories come from rice and canola oil. One rather obvious drawback is the lack of fruits and veggies here. This is a lean food with very few ingredients, and the conspicuous absence of fruits and veggies makes it hard to justify picking it up. That said, you can always supplement that at home, making this a good dog food for minimalist owners. If you're looking for the skinny on dog food for other big breeds, you might like this post on food for Great Danes. We also have a pretty solid guide on feeding a Weimaraner. What is the Best Dog Food For Papillons? Best Dog Food for German Shorthaired Pointers: Top Picks! I have been feeding my chocolate lab salmon blue buffalo. Is that good? ?